The metros in Beijing, Shanghai, Tokyo, Guangzhou and Seoul are the only ones that carry more passengers than Moscow’s Metro which, with a daily ridership of 6.7 million, is the busiest mass transit system in Europe. This is more than twice the number carried by London Underground, which has 270 stations compared with the Moscow metro’s 163. Muscovites and Londoners both need more trains. In London these will soon be provided by Crossrail. 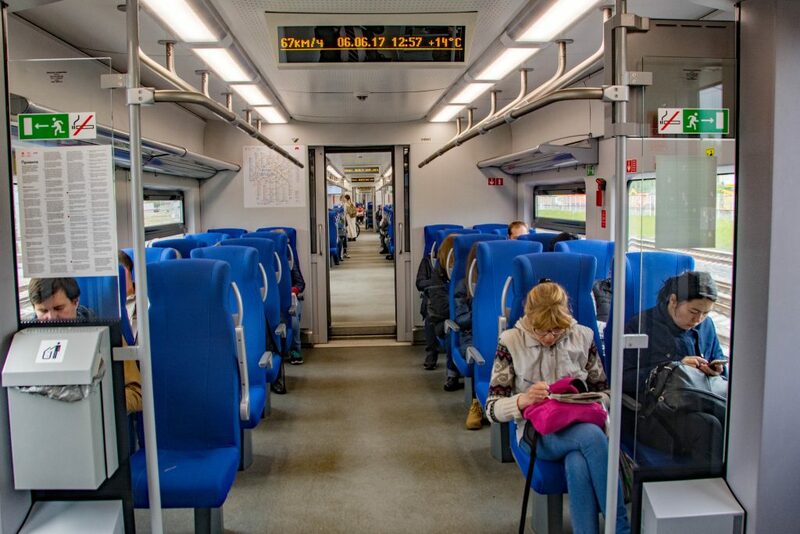 Moscow got its extra capacity in September last year, although in its case, these were from a line more akin to London Overground than the Elizabeth line. The little ring The 54-kilometre Moscow Ring Railway was opened in 1908 and operated as a mixed traffic railway. It became known as the ‘little ring’ of the Moscow Railway when a 584-kilometre outer ring was built during the Second World War. Up to 1960, it served as the city’s boundary. In its early days, freight proved to be the only viable traffic on the line, which provided a by-pass around the city, and passenger traffic was disappointingly low. These poor passenger numbers were further reduced by the developing city tram network and, as a result, its passenger service was withdrawn in 1934. By the 1950s, the city’s population had increased to five million, prompting calls to re-open the line to passenger traffic. These were rejected due to the high cost and the circular Metro Line 5 being opened around the same time. 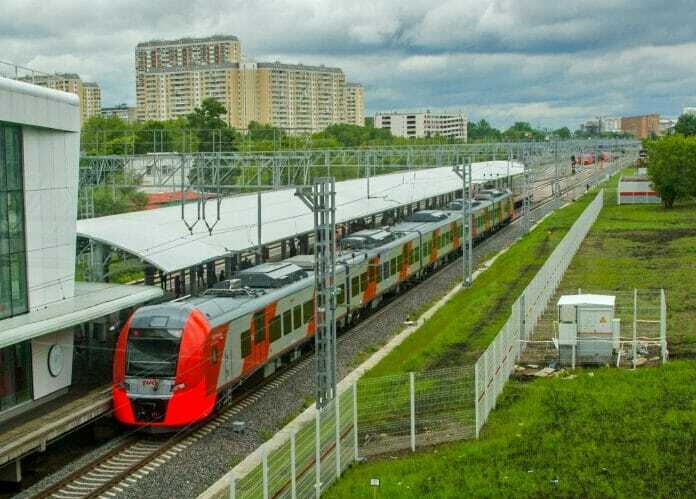 By the start of this century, there were ten million in the city, and a proposal to re-open the little ring was the subject of a memorandum of understanding between Russian Railways (RZD) and the Moscow city authorities. The project was formally approved by Vladimir Putin in June 2011, following which RZD and the city government set up a joint-venture company to deliver the project and operate the line which would become the Moscow Central Circle (MCC) railway. The new ring The design and management of the 71 billion roubles (£0.9 bn) MCC project was undertaken by JSC Roszheldorproject, which was formally part of Russian Railways. It required the construction of 31 new stations, the renewal of 183 new track kilometres and the removal of some of its connections with the radial railways. This included the provision of a third track over 31 kilometres of the circle’s length for the line’s 23 freight movements a day. It would have been prohibitively expensive to provide a third track throughout the circle due to its bridges over the Moscow River, adjacent roads and a road underpass tunnel. As a result, freight trains only operate at night. It also required the rebuilding of 74 overbridges and the construction of 28 ramps, bridges, overpasses and underpasses. 4,000 kilometres of utilities were diverted, and 14 kilometres of noise barriers provided. 86 of its early twentieth-century buildings were listed as historic monuments and had to be preserved. The MCC has been electrified at the normal Moscow suburban network’s voltage of 3kV DC. This required 4,945 masts and 178 kilometres of wiring and included reversible substations that, with other energy saving measures, are expected to give 33 per cent energy savings compared with other 3kV Russian lines. To ensure a high-frequency operation, the MCC has been signalled for automatic train operation (ATO) using Bombardier’s EBI Lock interlockings. The system has been designed to operate at a three-minute frequency if required and uses GLONASS, the Russian Global Navigation Satellite System, to monitor operation of its trains. Trains will operate at Grade of Operation (GoA) 2, in which starting and stopping is automated with the driver operating the doors and driving the train if required, with the intention of moving to GoA3 – driverless train operation – when it is safe to do so. At this year’s Strategic Partnership 1520 forum, Russian Railways President Oleg Belozyorov announced that: “The Moscow Central Ring is ready to operate without human participation. However, there is a very large passenger traffic, so the question of reliability arises… Hence, we need some period of time, maybe several years, to clearly state that such technology allows us to work without a human participation and at the same time provide full reliability.” Operating the circle When Vladimir Putin opened the MCC on 10 September last year, it had 26 open stations. A further five stations were opened in the next two months. Wherever possible, these stations have been made into interchange hubs. As a result, 105 bus, 40 trolleybus and 31 tram routes were altered. 22 of the stations have rail interchanges, five of these are with the suburban rail network, thirteen of these are with the Metro and four are with both. However, many of these interchanges require commuters to leave the paid area. When the line opened, Muscovites were offered a month’s free travel on it to encourage them to try alternative travel routes and, to an extent, dissuade them from contributing to Moscow’s traffic jams. Station signs are in both the Russian Cyrillic alphabet and English. Until recently there were few English signs on the Moscow Metro. They are now becoming increasingly commonplace as Russia prepares for the 2018 World Cup. 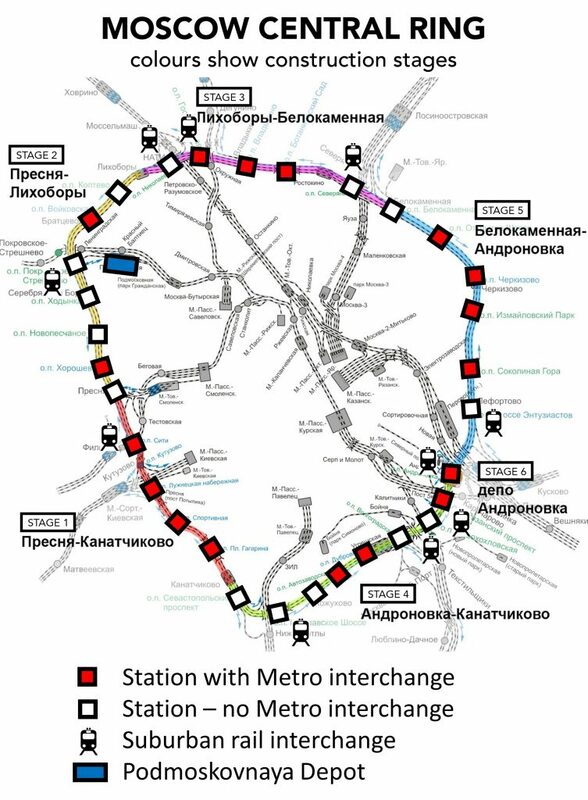 As its line 14, the MCC is fully integrated with the Moscow Metro with common ticketing and passenger services. However, Russian Railways is responsible for the operation of its 130 trains each weekday day, which take 84 minutes to complete the 54-kilometre circle. During weekdays trains run every six minutes in peak hours, and every 12 minutes in the off-peak. The contract to remove snow and ice from the MCC platforms requires at least 260 workers to work around the clock, with an increased workforce during heavy snowfalls. In sub-zero temperatures, air curtains at station entrances will be turned on to block out cold air. Circling swallows The MCC is operated by ES2G units, which are a high-density version of the Siemens Desiro EMU variant known as the Lastochka (Swallow). The MCC has a fleet of 36 of these units, of which 33 are required to operate the service. The contract for these units specifies localisation of their construction. They are produced by the Ural Locomotive Works in Yekaterinburg using mainly Russian components, which currently account for eighty per cent of the train’s value. 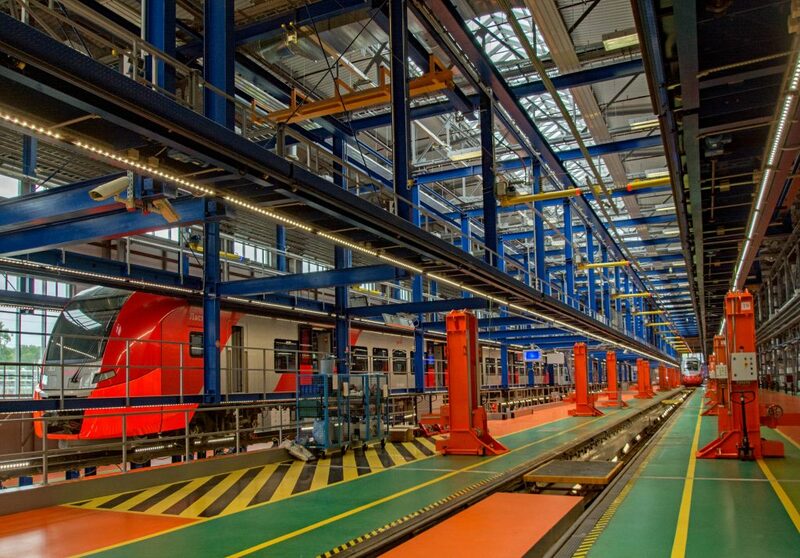 In two years’ time, it is expected that every part of the train will be produced in Russia. The ES2G units have 2+2 seating across a vehicle width of 3.48 metres and a power rating of 2·9 MW compared with 2·5 MW for the ES1 Lastochkas. Although they are capable of 160 km/h, the maximum speed on the MCC will be 80 km/h due to its large number of stations. Each five-car unit has 368 seats and space for 1,000 standing passengers. They are the only Metro trains that offer toilets, climate control, Wi-Fi, and electrical outlets, with access for mobility-impaired passengers and spaces for 12 bikes and prams. The fleet is stabled and maintained at Podmoskovnaya depot, which also maintains other trains and so has an allocation of 77 units. The depot was reopened in July 2015 after substantial rebuilding and is run by Siemens under a 40-year maintenance contract. The units currently receive a basic examination every 22,000 kilometres with a major overall at 600,000 kilometres. The intention is to move towards condition-based maintenance, as all the units have remote-condition diagnostics. Two units are also fitted with equipment to monitor track geometry and provide video surveillance. Significant defects are automatically transmitted to the depot, other information is recorded on hard disc. The information from the units is analysed by a data-processing centre at the depot, which was opened in February. This uses the Siemens Railigent platform to manage the vast amount of data received from the trains to improve train and infrastructure reliability and to move away from fixed examination periods to condition-based train maintenance. A step change In its first nine months, the MCC carried 70 million passengers, 61 per cent were from the Metro, 26 per cent from Suburban trains and 13 per cent from other modes of transport. There has been a five to twenty percent reduction in traffic on five Metro lines and nearly four million people a day have had their journey time reduced by nine to sixteen minutes. It is predicted that the MCC will be carrying 300 million passengers a year by 2025. Although the MCC passes through 26 districts of Moscow, with a total population of 1.9 million people, most of its catchment is abandoned industrial zones for which the new railway ring is expected to be a catalyst for development. It is expected that up to 10 million square metres of real estate will be rebuilt close to the new ring. Mohamed Mezghani, secretary general of UITP, the International Association of Public Transport, commented: “The MCC is more than just transport infrastructure, it is an urban development project which will certainly attract the new development of housing, employment and services around its stations.” The use of ATO, with its potential for driverless operation, and the advanced asset management provided by Podmoskovnaya’s data processing centre, means that the MCC also showcases Russia’s digital railway developments. Once the Elizabeth line opens in a year or so, London will experience its own step-change in transport provision. It will be interesting to see how Crossrail’s impact compares with the MCC and whether there is anything to be learnt from Moscow’s experience. For example, free travel for a month to encourage Londoners to abandon their cars doesn’t seem to be a bad idea!